The team mimicked the early development process with a precisely timed use of several small molecules that prompted the stem cells to differentiate, from one stage to the next, into precursors of the inner ear. But the three-dimensional suspension also provided important mechanical cues, such as the tension from the pull of cells on each other, said Karl R. Koehler, B.A., the paper's first author and a graduate student in the medical neuroscience graduate program at the IU School of Medicine. "The three-dimensional culture allows the cells to self-organize into complex tissues using mechanical cues that are found during embryonic development," Koehler said. "We were surprised to see that once stem cells are guided to become inner-ear precursors and placed in 3-D culture, these cells behave as if they knew not only how to become different cell types in the inner ear, but also how to self-organize into a pattern remarkably similar to the native inner ear," Dr. Hashino said. "Our initial goal was to make inner-ear precursors in culture, but when we did testing we found thousands of hair cells in a culture dish." Electrophysiology testing further proved that those hair cells generated from stem cells were functional, and were the type that sense gravity and motion. Moreover, neurons like those that normally link the inner-ear cells to the brain had also developed in the cell culture and were connected to the hair cells. 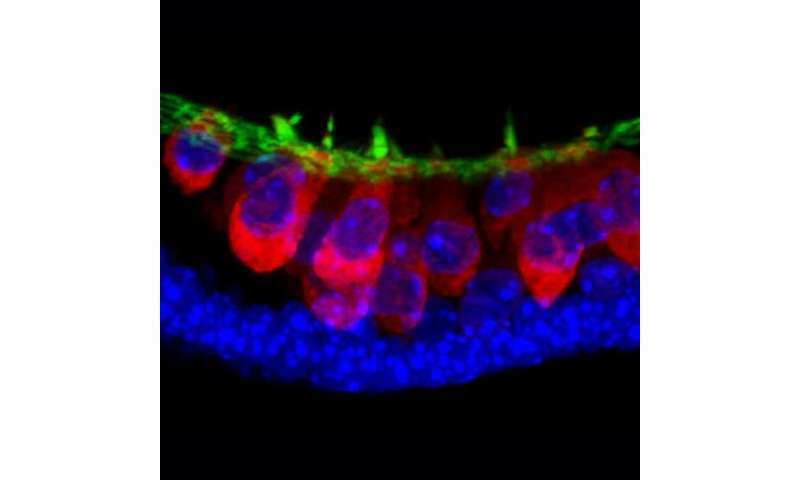 Additional research is needed to determine how inner-ear cells involved in auditory sensing might be developed, as well as how these processes can be applied to develop human inner-ear cells, the researchers said. However, the work opens a door to better understanding of the inner-ear development process as well as creation of models for new drug development or cellular therapy to treat inner-ear disorders, they said. I am always wondering whether those that have discouraged this kind of research...whether they are lawmakers or not will get sued in future after getting their maladies rectified in probably distant future....for being made to wait for so long! It is imperative that tax payer's monies be spent for the welfare of tax payers and NOT for Wars. "In a study published in the journal Nature, a team led by Marcelo Rivolta at Britain's University of Sheffield said they had found a way to turn human embryonic stem cells into precursors of these vital ear cells to reverse the deafness". Embryonic Cells Battle each other to Death & Eat up the lost opponents. The more the Myc protein it has, the more powerful the cell is in those fight-to-death battles. Certain things are certainly happening. http://news.yahoo...666.html "Gov. Pat Quinn suspended Illinois lawmakers' pay on Wednesday, following through on his warning of consequences if they failed to come up with a solution to the state's nearly $100 billion pension crisis. " Dangerous or not....Artificial life creation (A functional, multiplying Bacterium... with no nucleus) 3 years ago from 4 DNA pieces contained in plastic containers that were bought and Bread maker Yeast cell (Nucleus containing) in next 5 years by several countries together. May be Elephant/Whale by Next Century....Who Knows...Probably Very Dangerous Route.